We no longer having many Christmas lights in Melbourne as we are saving green house emissions. Nevertheless, the city glitters with Christmas decorations. 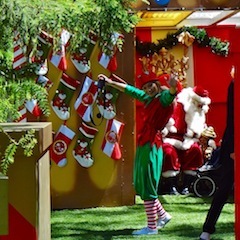 Christmas Melbourne is also big with performances, and glittering decorations over Swanston and Bourke Streets. There is a gigantic Christmas tree on City Square, corner of Swanston and Collins Streets, that has a special light show each night creating an ambient atmosphere. At Santa's Post Box Children can post their Christmas wish list to the North Pole. There are also performances, christmas parades and city celebrations. 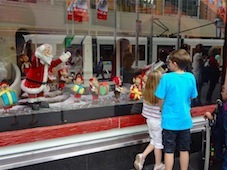 What draws a pilgrimage of local and outside visitors are the Christmas windows of the Myer store in Bourke St. Each year the puppets and decor in a series of animated windows tell a story. The theme is a secret until revealed on the opening day in November. 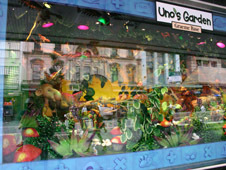 We've seen the Grinch, The Twelve Days of Christmas, The Nutcracker... each a fascinating selection of moving puppets and displays. The Myer Christmas Windows first appeared in 1956, the year of the Melbourne Olympics. Each year they tell another story: one time a Fairy Tale, another a story of a famous Children's book or a theme from Ballet or opera - each year more fascinating and engaging. Often you have to queue up to see them - but well worth the wait and a must-do with kids. Every year, mid November, Myer hosts a Christmas Spectacular in front of its stores in Bourke Street, broadcast live on Sunrise. This is a must do event with small kids - and Bourke Street is filled with prams under 5s. Santa appears as well as a host of celebrities, taking part in a Christmas Concert. Altogher a big show, activities and entertainment. Christmas decorations also extend into the Docklands, with a nautical-themed Christmas tree made from red and green buoys. There is weekend entertainment and a Waterfront Twilight market in the middle of December. Then there are distinctive Spanish-designed Christmas lights in Hardware Lane, similar to those found in Barcelona and some South and Central American cities. Italian Christmas comes to life in Carlton's Lygon Street during the La Befana, when the legendary good witch loved by Italian children will be flying in for a day of children's activities and performances. In the suburbs there used to be many homes decorated with an abundance of Christmas lights in Melbourne, especially in the ethnic areas. They are still there but are suffering now with growing environmental awareness. 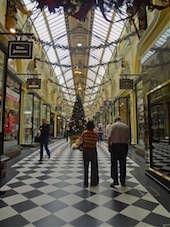 Around Christmas Melbourne can be bursting with shoppers. If you want to escape the Christmas stress, have a look at the Christmas windows early one morning and then head off to any of the Melbourne original art and craft markets where you can find original Christmas crafts and toys - this is a relaxed way to shop, supporting the local community and you are bound to find something special there.